Spam is a breakfast favorite in our home. Among the different variants, we’ve tried the regular, lite, bacon, cheese, black pepper and garlic flavors. Personally, I like the bacon-flavored Spam best of all. 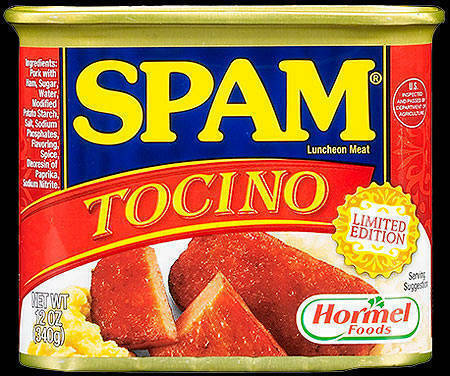 The past few weeks, however, i’ve been seeing a lot of posts and blog articles regarding Spam Tocino. I love tocino and the thought of tocino-flavored Spam was enough to get me hungry. Reviews have been generally favorable. I’ve been looking for it in the SM Supermarket closest to us but no such luck. Until today, that is. Just like actual tocino, this caramelizes during cooking. It has a reddish color like tocino and it does taste like tocino. I liked it but still prefer the bacon variant. I think it’s great, though, that Spam came out with the Tocino flavor. This entry was posted in Food, Grateful Project and tagged Grateful Project, Spam Tocino. Bookmark the permalink.